I’ve just logged into YouTube, and a large banner advertising the latest action blockbuster is displayed at the top of its home page. As I tune into online news clips and music videos, short ads play constantly before the content I’m about to watch starts. They’re trying to sell me cars, beer, cell phone networks and so much more. I’m sure you’ve recognized the shift towards the monetization of YouTube in the last few years, but have you ever wondered how much of this ad revenue goes to the reason YouTube is fun? As in, its content, and the creatives who supply it? YouTube generates over one trillion page views a year. Nearly 30 million unique visitors pop by the site each day, and they watch about 3.25 billion hours of content a month. Short ads are played before many video clips and Youtube keeps 45% of the income these ads generate (Investopedia). Advertisers typically take about 30-60% of the cut (HuffingtonPost). Major hosting platforms like YouTube also claims property rights, stipulating that creators cannot post their creations on other video-sharing mediums. Due to this model, many channels currently generating millions of views have yet to see a profit. This poses an important question: Why on earth should a full-time artist reaching an audience of millions need to ‘supplement’ their income? And what can be done to destroy an imbalanced status quo? Say hello to Tron, a blockchain-based startup with promising solutions for issues in the realm of digital rights management and long-stymied artist pay. Tron is an entertainment system operated by a non-profit organization. At its core, a platform like Tron will allow artists, like the short film makers of YouTube, to earn a fair living from their work while still providing free content to users. Additionally, they can accept donations at minimal transactional costs with no platform lock-in through an effortless blockchain currency exchange. Many casual internet users unknowingly conflate blockchain with Bitcoin, a digital currency fueled by blockchain. The blockchain technology itself, however, offers us so much more. The concept of ‘decentralization’ between Bitcoin and other blockchain projects are the same – a central power source is removed and consequently, so are timeworn barriers to fruition from older models. In the case of Tron, artists can now receive the full fruits of their labor through an intelligently functioning marketplace that will financially incentivize content creators. Tron’s exchange and purchase of digital assets will effectively motivate content creation. Donation-style ‘micropayments’ can be rendered in exchange for content, something that was once inappropriate due to transfer fees exceeding intended payment amounts. With the ‘centralized’ middlemen removed, internet-based artists stand to profit a liveable wage from their work. It sounds simple, but in praxis this will be revolutionary. At the same time, consumers of artists’ content can save on paywall costs for conglomerate-mediated subscriptions like Google Play and Spotify. Automated blockchain-based ‘smart contracts’ can fairly distribute cash and resources, and a decentralized content-hosting protocol like Tron prevents data from being owned or compromised by any single organization. Rather, control stays in the hands the artists. 2007 saw the monumental ‘pay-what-you-want’ digital release of Radiohead’s seventh studio album In Rainbows, which, if anything, taught us that there is no ceiling for success when it comes to artists releasing their own content without all the corporate financial filters. In its current state, the way we consume media online will not help anyone but already-super-famous content creators. A signed solo YouTuber, working alone to write, produce, edit and find original, non-copyrighted music for their videos requires around 4.2 million hits a month to earn the U.S. minimum wage. The difficulty artists encounter on popular music streaming services is similar (Guardian). An automated, self-stimulating ecosystem and cryptocurrency based payment network like Tron could foster competition for the media-hosting giants and perhaps force them to rethink business practices. As with any capitalist market, businesses need competition to flourish and remove exploitative practices. Power should not be so heavily held by one source, and if one prosperous company raises its pay ceiling, so will the rest be forced to. YouTube and Spotify don’t have a monopoly on video and music streaming protocols these days, but they do on user attention. Copyright is another huge issue for content-hosts like YouTube. The company has a system in place which automatically removes material flagged as violating their copyright code—say, a song playing in the background of a video. In many situations, these have proven to be baseless, exposing YouTube’s status as a computational wild west of bad claims. Endless stories are released on forums like Reddit involving abuse by copyright-removal bots that have heedlessly doubled down on their erroneous decisions. Some users have challenged these claims only to have their accounts suspended. This system is abused by companies to silence criticism, delete contentious channels and effectively disrupt livelihoods (Kinja). Tron’s employment of an unalterable, timestamped blockchain ledger could also break the mold of many users desperately trying to hold on to rights of their own digital content. Important to note here is that Google’s own algorithms control traffic and any slight change in YouTube’s search function results could be detrimental to the exposure of certain channels. As you can see, creators having rights over their own work has never been more important. Competition in this market would both create a much-improved alternative for the current model and pressure the current state of abusive legal decisions into asserting some credibility before imposing sanctions. From TechCrunch: “Consider how many networks the modern western user is part of – Facebook, LinkedIn, Twitter, Uber, Airbnb, eBay, Etsy, Tumblr – the list goes on. In each of these cases the network’s value is created by the users, but the value each individual user generates goes to the owners of the network.” In other words, billions of dollars in revenue websites like the above generate could be circulated among contributing members, rather than corporate owners. 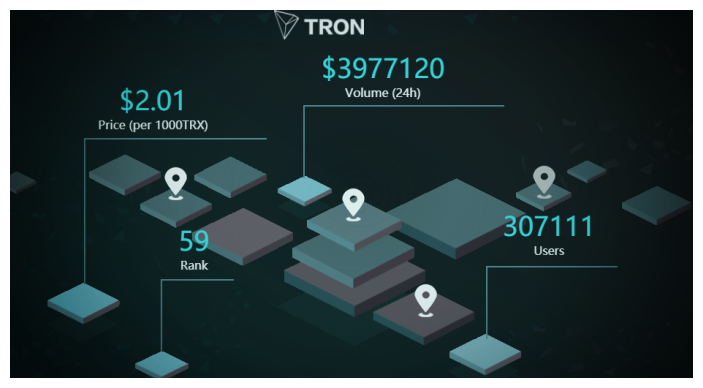 A task like Tron comes with its share of challenges. It’s no small feat informing people to see the advantages of a decentralized entertainment platform, nor is asking average internet users to disengage from convenient, popular mediums. This is a long term project. The sooner crowdfunding kicks in, however, the faster this system could boot. With your help, artists will be able to own their publicized content and control their own financial futures. Click here to see more blockchain technology companies.